If you have a website or an online business the following terms may ring a bell: SEO and Google Ads. They are the top 2 methods to get found when people perform searches in online. Right now, potential customers are searching online for what your business offers. Will your website be found? Google Ads (formerly AdWords), also known as pay-per-click, is a paid platform owned by Google that allows your website to appear on search engine results page (SERP), Google Products (YouTube, Gmail, etc.) and more of Google’s partner websites. Popular search terms are more expensive to purchase so before starting a paid marketing scheme it is important to understand your customers and their trends in behaviour when they search your products/services, and also to analyse your competitors. With Google Ads there, since paid searches are immediate you do not need to wait for the rankings of the organic search engine results. 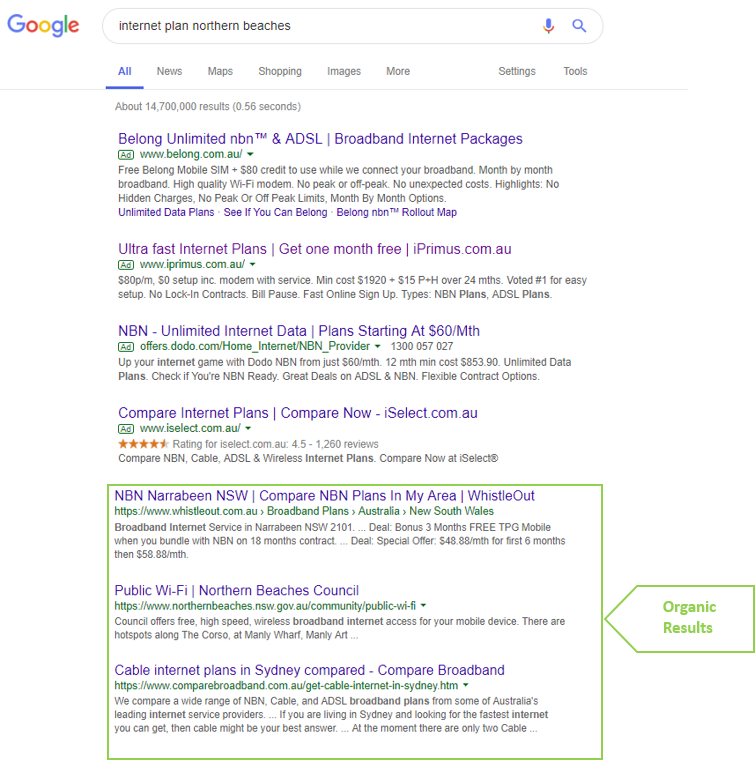 They fit in your budget and are usually listed at the top or side of a SERP with the green label ‘AD’ referring to advertising. 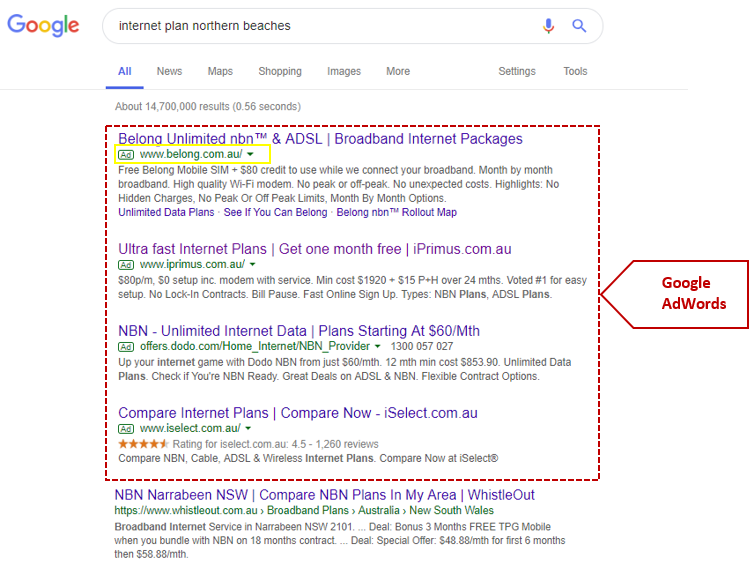 In a nutshell, specific words are chosen for a user of a search engine, then an advertisement is created on the SERP base using those keywords. The next step is bidding an amount of money in these keywords and then paying this value each time your ad is clicked. The advantage of Google Ads is that you can run a long-term and short-term campaign for a specific product or a new service you are offering and you can control which keywords your website will be listed for. Be aware: if your industry is very competitive and the Cost per Click is more than your ROI (Return on Investment) then it is hard to benefit from Google Ads. This is where the management of Google Ad campaigns is very important. A well managed campaign will focus on keeping your Cost Per Click low, improve conversion rates, and/or achieve set goals. Search Engine Optimization (SEO) refers to attempts to improve search engine rankings from pages like Google, Bing, and Yahoo. Companies that are placed on the first organic rankings tend to be more trusted than advertised. However, it is not simple to understand the complex algorithms used for search engines to optimise your website’s ranking. Also, Google regularly updates their search algorithm which impacts on the rankings. In order to get the results, your website needs to be search engine friendly, therefore, some configurations are utilised such as relevant content, mobile friendly websites, optimised and tagged images, headings appropriately tagged and so on. Organic SEO takes a lot of effort and techniques, as well as patience in order to get your desired results. But once the website is established you will have long-term results that will help your business grow visibility, through traffic and sales. The following two tools are not competitors: Google Ads and SEO can be used together to make your digital marketing strategy more powerful; for many businesses using both the paid ad and organic tools often work best. Keep in mind that organic rankings give your business a long-term result while paid ads give it an immediate result, increasing your visibility. Yet ultimately there is no single clear-cut solution as it depends on your business, competitors, target and budget. If you are still unsure about what is right for your business, contact us today and get a free website assessment from one of our specialists.